Brendan of Ireland is remembered with great affection for his great sea voyages which captured the imagination of the people of his own time – and many in every age since. As a result he is widely known as ‘Brendan the Navigator’. He is also known as one of ‘the twelve apostles of Ireland’, along with Columba (see June 9th), Ciaran and others. He belonged to a tribe which lived in County Kerry. It is said that Ita ( January 15th) fostered Brendan as a boy, when he was a pupil at her boys’ school. He once asked her what were the three works most pleasing to God, and the three most displeasing to Him. Ita answered, ‘The three things that please God most are true faith in God with a pure heart, a simple life with a grateful spirit, and generosity inspired by charity. The three that most displease God are a mouth that hates people, a heart harbouring resentments, and a confidence in wealth.’ Brendan went on to live by these principles. After leaving school he worked as a fisherman off the Atlantic coast for five years before entering the monastery of Inishmore as a novice. Later he founded some large monasteries himself, including that of Clonfert in Galway, on the opposite side of the River Shannon from Clonmacnoise, and he was eventually buried at Clonfert. There are many dedications to Brendan (sometimes rendered Brandon or Braddan) across western Ireland, the Isle of Man and the west of Scotland. All through his life he had heard the tales of his elders about ‘The Land of Promise’ way out across the ocean to the west, and the desire was stirred in him to sail away to find it. When this urge became too strong to ignore, he recognised it as God’s call to him. At the end of the Dingle peninsula is Brandon Mountain, and at its foot is Brandon Creek, the traditional departure point for Brendan’s voyages, undertaken with companions from his monasteries. Later the stories of his voyages were written down as the ‘Navigatio’. The accounts seem to read partly as travelogue and partly as a spiritual journal or allegory. The vivid images of the tree full of angels and the vision of Judas are haunting examples. Yet real voyages were undertaken. Tim Severin’s book, ‘The Brendan Voyage’, recounts how he sought to replicate what Brendan had done, right down to the actual construction of the oxhide boat used, demonstrating that such voyages could have been undertaken in those far-off times, even as far as North America. Often what he and his companions experienced on their travels in 1976 and 1977 reflected those which the original accounts describe so poetically, previously dismissed as pure fantasy. 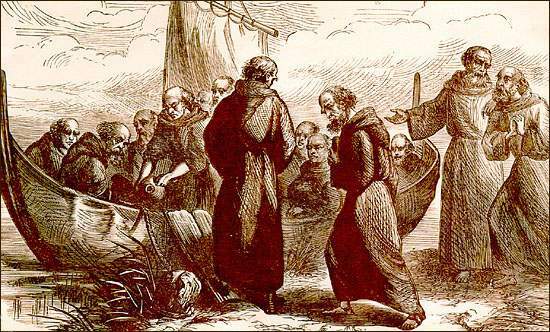 It is known for certain that Irish travellers of Brendan’s time, including many monks, were sailing to the Orkneys and Shetland, the Faeroes and Iceland on a regular basis. The prayer suggested for today is adapted from the Community’s ‘Brendan liturgy’: On my journey of life, Christ of the mysteries, may I trust You on the sea. Let me not assume that the storms will be stronger than You. Give me the faith to leave old ways and break fresh ground with You. Give me Your task, Your blessing, and establish what my hands can do. Feed me, and, somehow, make my obedience count for You. Amen.